What do you do with books you don't want to keep? When my DB moved to Avignon, he decided to lighten the load by getting rid of a number of his books. Pushed for time, he was just going to throw them out, but I said I'd take them. Throwing out books, even vile trash like the one Fréderic Mitterand wrote (about sodomising little boys in Bangkok in his ill-spent youth), just goes against the grain. Actually, I probably could put a match to his books and not feel much remorse. I have no room for the rest on my shelves which are already packed two-deep. Most of my book purchases now go on my Kindle. Not only can I buy books in English more easily, but there is ample room on the device to keep them. The SAS book is one of a series written by Gérard de Villiers starring the Austrian prince and CIA spy Malko Linge. About 120 million of the two hundred books written have been sold worldwide. I'd never heard of them, but they are on a par with Ian Fleming's 007 books and particularly popular in Germany, Russia, Turkey and Japan. My DB has read almost all of them. 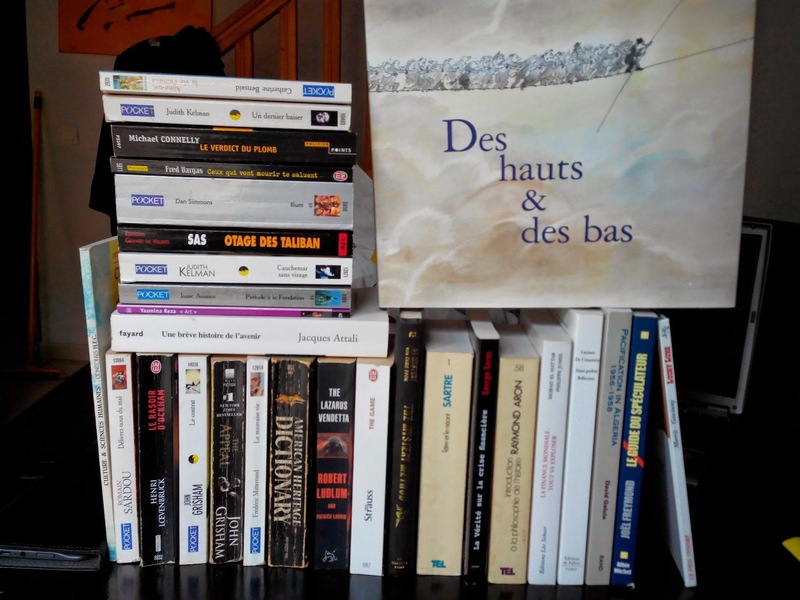 The only book of any value is Sempé's 'Des hauts et des bas' which is worth about 20Eur on Amazon. Should I try to donate these French books to the local library? What if they don't want them (I wouldn't blame them for not wanting Fréd's 'torchon'). It's not a very big place, and they might want to reserve the space they have for new acquisitions. Then there's selling them on Amazon. I doubt I could ask for much, because even if I put them up at 0.01Eur, the postage would be enough to put most people off, and I'd still have to wrap them up and take them to La Poste. A lot of effort really. Maybe I'll take them to Gibert Joseph in Montpellier. It's a second-hand bookstore right in the middle of town. On their website there's a section called 'Je Vends' where you enter the bar-code of the books you want to sell and it'll tell you whether they'll accept them and for how much. You take along your books and they are finally off your hands. In theory. My DB tried this, took along his books and discovered that the bookshop wouldn't take them after all. A big waste of time. After a brief browse on the internet, I've discovered other solutions. La Fnac offers a secondhand book section. You can fix your price, payments are made through their site, but you still have the books hanging around until someone eventually decides to buy them at which point you have to pack them up and take them to the post office (= faff). 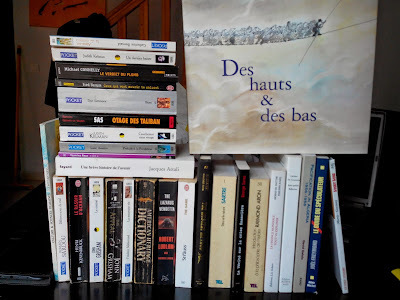 If you're lucky enough to live in Paris, Bordeaux or Lyon, for the purpose of getting rid of books, that is, there's a service called Recyclivre which will take your books 'dans un geste solidaire'. They will come and pick them up (in an electric vehicle) and then sell them through their site. They declare their business to be 'eco-citoyenne' and 'un service unique'. They don't operate in Montpellier so I'm not that bothered by what they are, but I do like the counters on their website which count how many trees and how many litres of petrol have been saved thanks to each sale of secondhand books. They also donate 10% of profits to organisations that work to reduce illiteracy, etc. Obviously good eggs. Pity we don't have a good choice of charity shops here. The Croix Rouge exists but getting to their centres is a pain. Emmaüs is another option, and I've just seen that they will collect (even a few books?). According to an article in Le Monde in 2012, over a third (37%) of books are bought secondhand in France so maybe if I exert myself a little perhaps I could make enough to buy a nice bottle of white fizz to go with the smooth and silky elderflower cordial I made this weekend, flowers bought from La Ruche Qui Dit Oui. That way too, my DB could enjoy his books a second time around. (Except Fréd's livre de la honte - book of shame. It's amazing how he's been spared prison for abus sexuelle sur mineur, but then the Soixante Huitards have a Teflon coating when it comes to paedophilia. Much like British members of Establishment except I don't recall any of them actually writing about their desires and experiences in a book and getting away with it... but I digress...). In the meantime, they'll have to stay cluttering up the dining table. I'm lucky, our school has an annual used book sale in March but they start collecting in December so I don't have to store books for very long. I used to keep everything I read, but now I just keep the ones I think my guests will like, as well as the good hardbacks. That is lucky. Our school used to have jumble sales. So useful! Teflon...and how! Can you imagine writing a book about your revolting activities...and can you imagine any respectable publisher accepting it? I frequently find myself gobsmacked about what the 'elite' get away with here, aided and abetted by an undiscerning media. What a country. Goodness, you read five books a week that you then take sporadically to NZ? I dread to think how much you pay in excess baggage!! I'm so glad you've decided what to do! Looks like the best option before they're getting on your nerves and you do something rash. Maybe they'll reach someone with as weird taste! We are trying to downsize a bit into post-children-at-home mode, and our local Emmaus takes books, DVDs, CDs and video-cassettes. We have to drop them off ourselves, though. Selling things on line for 1 cent hardly seems worth the trouble of having to take them to the post office and so on -- if indeed they sell at all! I agree, Betty. It's so not worth the effort. I gave the books to my boss in the end. :) Any he doesn't want he can take to Emmaus. He goes down that way more often than me.